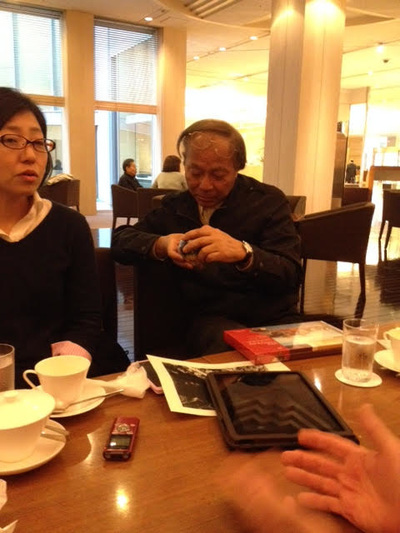 It was with a great deal of surprise and excitement on our initial meeting with reporter Kahori Sakane, POW expert Toru Fukubayashi, and photographer T.K. , to learn that Capt. 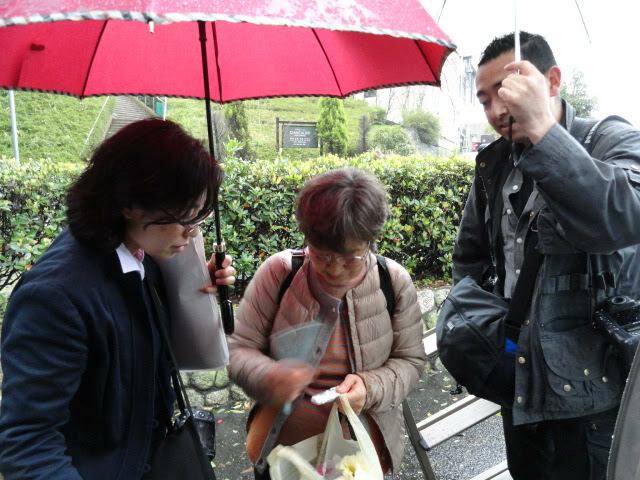 Ogata's daughter, Hiroko, had agreed to meet with my family and I.
Kahori explained that she had been in contact with Hiroko, who had initially been reluctant to meet me because she felt it might be too emotional and that she had always had mixed feeling about her father. She finally agreed to come after concluding that if I was coming from America to honor these airmen, the least she could do was meet me. Traveling alone by train from Yokohama, she met us at a hotel in Osaka for breakfast. 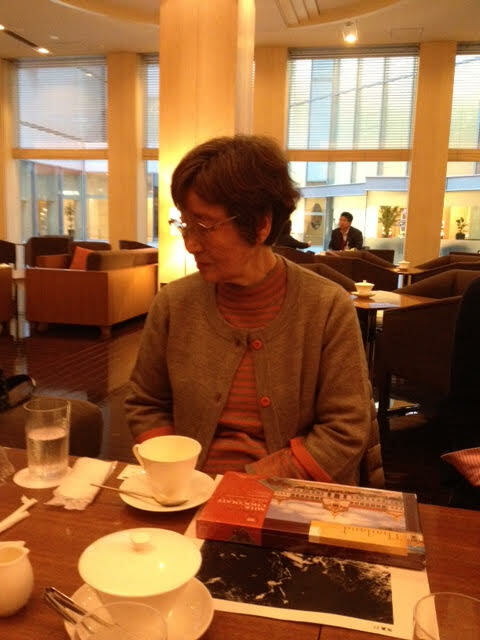 Meeting Hiroko. Like many Japanese of her generation she was properly reserved, almost shy, and apprehensive not knowing how we would receive her. But, my family and I embraced her as we would a family member and I even gave her a hug, which seemed to embarrass her. We exchanged gifts and got along famously. With Kahori and T.K. Interpreting, and Toru providing additional information, Hiroko viewed our website and I answered her questions as honestly as possible about her father and what happened on March 17, 1945. And she began expressing her life long feelings and impressions she had suppressed for decades. For most of her life, Hiroko had felt a sense of embarrassment that her father had purposely rammed his plane into my uncle's B-29, killing himself and the boys on the bomber. This idea had haunted her for years and caused her much regret. That is why she had discontinued telling anyone her father had been a captain and a soldier. It upset her that her father had killed himself, as well as enemy soldiers during the war, leaving so many children fatherless. She wondered if he had been a kamikaze pilot. She also asked about Uncle Bob's family. I told her that at the time of his death Uncle Bob left behind his wife, a 3 year old son, a 2 year old daughter, a baby girl he never saw. To erase these negative thoughts she had of her father and that he had been a kamikaze, I used her father's own words as a reference. I told her her father's last words were "Enemy bombers are clearly lit up by an inferno on the ground of the urban area. One plane destroyed. I'll keep on attacking." I assured her that her father was a fighter pilot with the 56th Sentai from Itami Field, and was "not" attached to a designated kamikaze group. Her father was an "Ace" fighter pilot with many enemy aircraft shot down. Members of the 56th Sentai refuted any suggestions that her father purposely rammed the B-29. His job was to shoot down enemy bombers, not ram them. 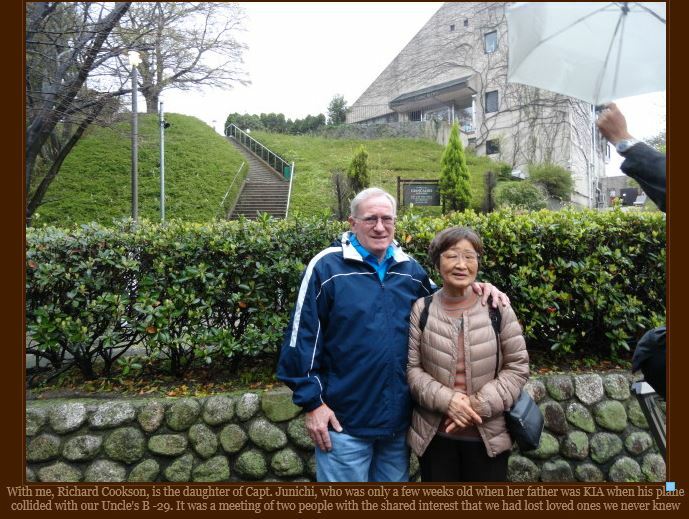 To further convince her of her father's intentions, I referenced eye-witness accounts of POWs and Japanese on the ground who saw "a bright flash of light like a shooting star (Capt. Ogata's Hien) streak across the sky, then a high explosion" when Capt. Ogata struck the B-29. I told Hiroko I couldn't explain what it was, but something happened to her father's plane while it was in flight. Either his plane had a mechanical problem, it was shot by machine guns from a B-29, or it was struck by his own anti-aircraft fire from the ground. Whatever the case, I assured her something happened while he was attacking. 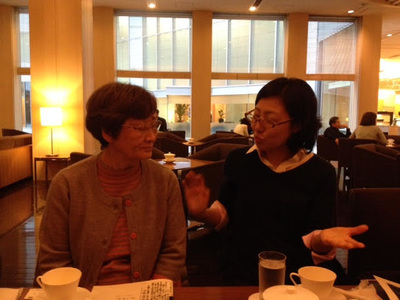 Hiroko told me she was comforted by what I was telling her, and that it had changed the feelings she had about her father and what he had done. She said " our meeting was a life changing event for her." She could now erase the shame that she sometimes felt towards her father. I was very proud of her and happy she could now have some inner peace for herself. I told her that "both her father and my uncle had killed people, but they were only doing their duty as soldiers without questioning it. And they did it to the best of their abilities. The important thing now is that you and I are meeting in peace and as friends." Leaving the hotel we proceeded to Kobe to continue our journey. On our way up to Mt. Futatabi we stopped at a point over looking Kobe City, where Toru Fukubayashi pointed out to us on a map the location of the crash site and memorial. From there we went up to the Dairyuji Temple where the memorial is located. Hiroko did not accompany us to the memorial at the temple, feeling it would be too emotional and stressful. We understood. So, in her absence we placed the flowers and lit the incense on the memorial that she had given us, and said a prayer for Capt. Ogata, my uncle, and the crew of the Z Square 8. We were able to personally pay our respects to ten boys who had lost their lives. We paid our respects to the Honored Dead. Thank you to Toru, Kahori, T.K., and my family for sharing this solemn occasion with me. I am very honored and pleased to have met Hiroko, and glad we could provide her with a sense of peace about the way she viewed her father. I am so thankful my family and I could spend time with her. She will always remain in our hearts and minds. Our heartfelt thanks to Toru Fukubayashi, Kahori Sakane, and T.K. for leading on such a memorable journey. My sincere thanks to Professor Kazue Masuyama, Sacramento State University, for taking time out of her busy schedule to translate the attached Japanese newspaper article into English for me. Many thanks, Kazue! 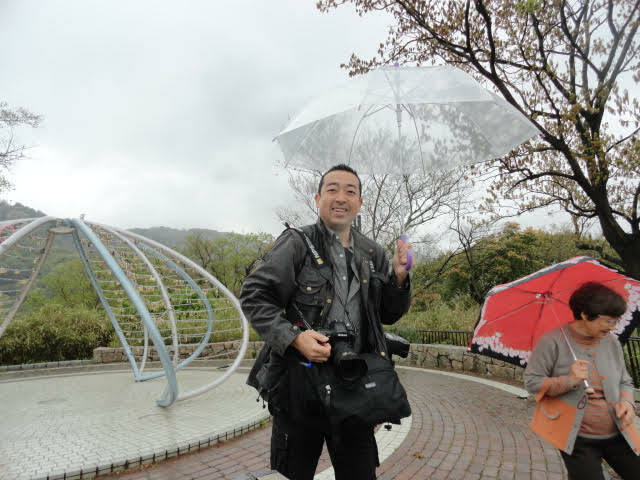 Article published by the Yomiuri Shimbun, Osaka, and written Kahori Sakane. Photos by "T.K." Describes my visit with Capt. Ogata's daughter and the crash between her father and my uncles's B-29. The following is the English translation of the article. Meeting of the war bereaved of a B-29 and a Hien. was 7491, and that of those injured was estimated at over 17,014. It is speculated that the B-29s dropped more than 2328 tons of fire bombs on the March 17, 1945 air raids after they had bombed Tokyo, Nagoya, and Osaka. 70 years after the war. The Kobe air raid and the crash of the Z Square 8 and Capt. Ogata. "Let's have peace so that we may talk together." 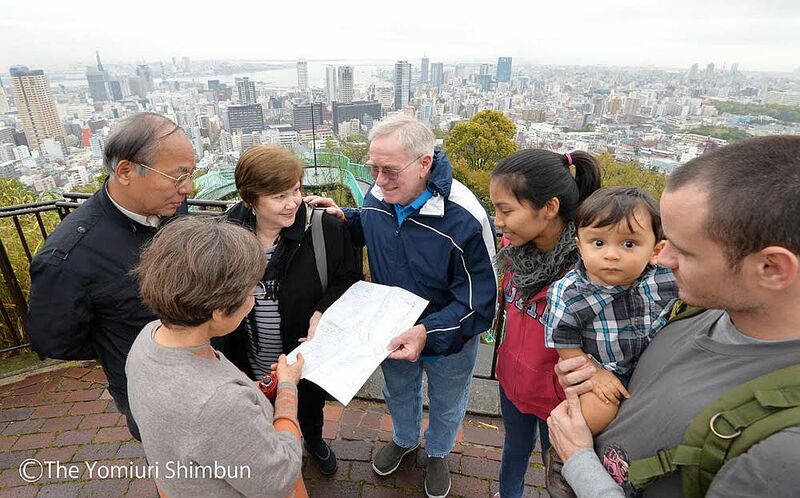 Hiroko, the daughter of Hien (Ogata) pilot that crashed at Kobe air raids is (front on left), Richard Cookson (3rd from left) and his family, April 14, 2015 in the Chuo district over looking Kobe City. 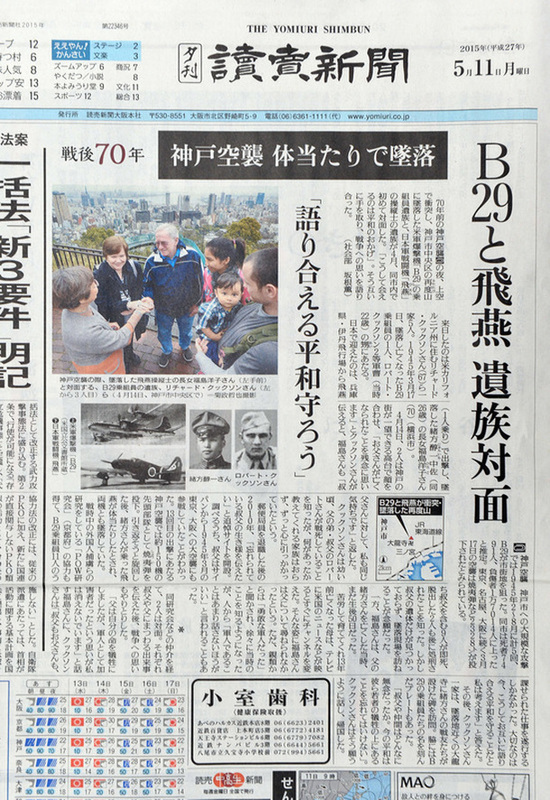 The Yomiuri Shimbun front page chronicalling the visit 2015. Photo courtesy of Tetsuya Kikumasa and the Yomiuri Shimbun. Seventy years ago, during the night of the Kobe air raids, a U.S. B-29 bomber and a Japanese Hien fighter crashed in the air and fell down to Mt. Futatabi in the Chuo district, Kobe City. The war bereaved of an airman on the U.S. bomber, and the pilot of the Japanese fighter Hien, met for the first time in Kobe in April. "Thanks to peace we are able to meet," as the took each other's hands and talked about their thoughts on the war. 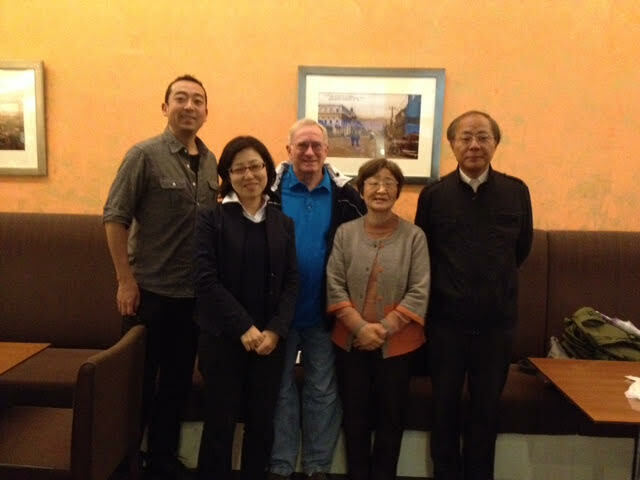 Mr. Richard Cookson (67) and his four family members visited Japan. His is the nephew of Mr. Robert Cookson, Staff Sergeant (at the time of his death 22 years old), who was one of the B-29 crew members who were crashed and killed on March 17, 1945. 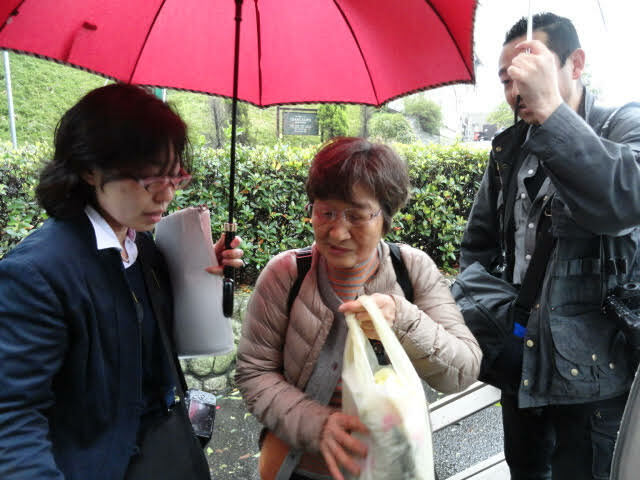 The person who welcomed them to Japan was Hiroko (70), ((I am not listing her full name to protect her privacy-Rich Cookson)), the daughter of Mr. Junichi Ogata, Lt. Colonel, at the time of his death 26 years old, a pilot of a Hien (one person fighter), who took off from Itami airfield in Hyogo Prefecture and crashed. 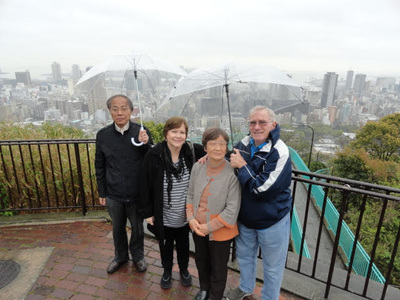 On April 14, 2015, they stopped to talk on a hill where they had a birds eye view of Kobe. Mr. Cookson told Hiroko that "It was regrettable about the death of your father." 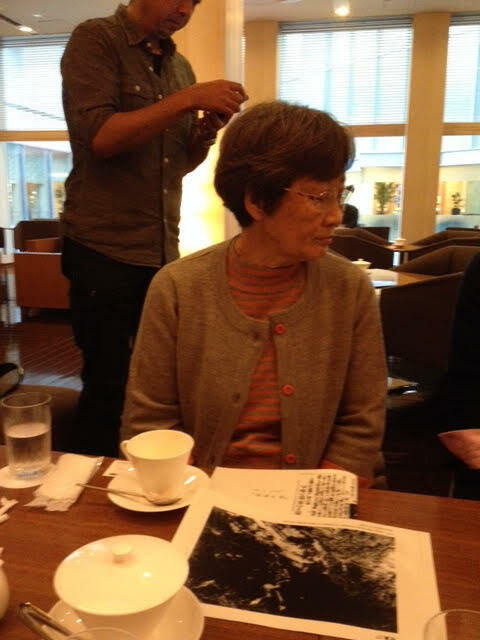 In reply, Hiroko said that "I feel the same way about the death of your uncle." Mr. Cookson learned about the death of his uncle when he was small, but he knew little because his family would not discuss what had happened. He had been thinking about his uncle for a long time. In 2010, after his retirement from the Postal Service, he began a memorial website for his uncle. "I want to talk about the life of my uncle so he and his crew mates will not be forgotten." 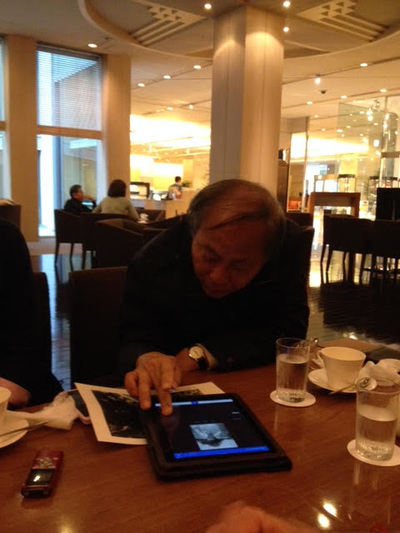 While researching, he found out that his uncle participated in big raids over Tokyo and Osaka in March, 1945. On the Kobe raid, they were one of hundreds of B-29 bombers dropping fire bombs. On their way back, a Hien Japanese fighter crashed into his uncle's bomber and both went down. Having support from research groups and POW researchers (Toru Fukubayashi), Mr. Cookson learned that 9 soldiers, including his uncle, had died instantly. Two surviving soldiers were later executed. It has been Mr. Cookson's wish to visit the crash site. 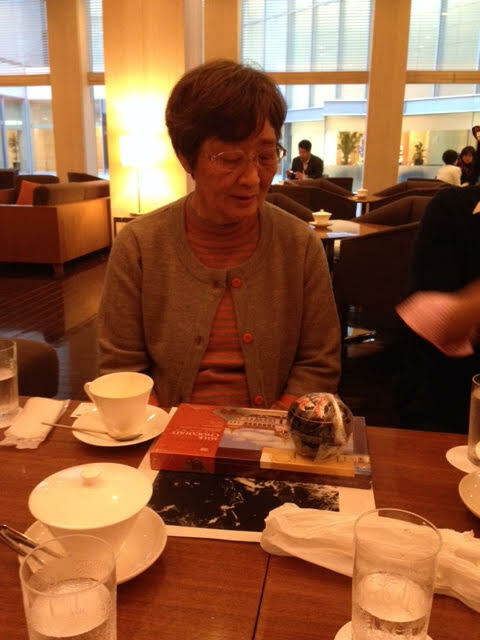 On the other hand, the mother of Hiroko passed away 13 years ago. She had had a very tough life while trying to raise Hiroko. Hiroko was never able to ask her mother about her father. Her mother would even change the TV channel whenever news about the U.S. came on. Hiroko's relatives did tell her that "Your father was a brave soldier," and she gradually learned about her father. However, many others said to her that " You had better not talk about your father being a soldier." Through the introduction of others, Richard and Hiroko met. After having talked about some episodes of his uncle and her father, they exchanged their thoughts on the war. 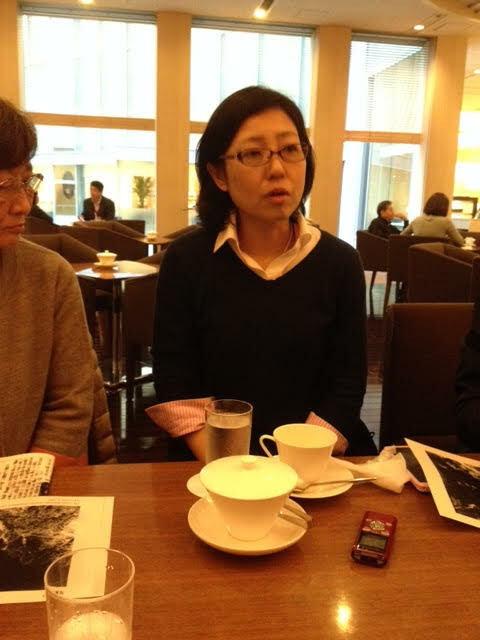 Hiroko said "My father sacrificed his life; however I can't erase my feeling that he was also a victimizer." Mr. Cookson responded to her that "Both my uncle and your father had to carry out their given duties. I think what is important now is that we live in peace and continue to have these conversations." 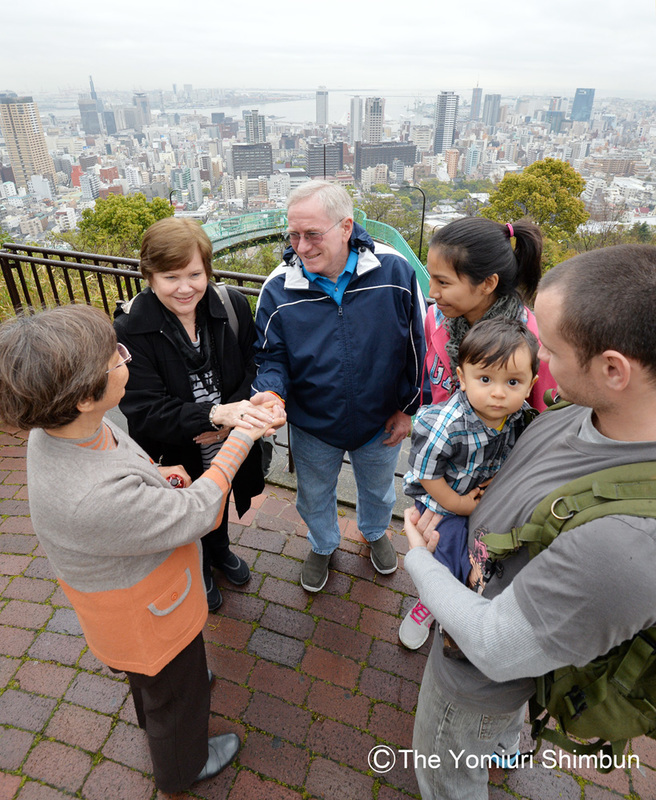 After that, the Cookson family visited the monument dedicated to the memory of the deceased, built by Mr. Ogata's fellow soldiers at the Dairyuji Temple near the crash site. Attached to Mr. Ogata's memorial is a plaque engraved with the names of the B-29 crew, Z Square 8. Mr. Cookson said "How regrettable that my uncle and his crew mates never realized how great they may have become. We should not forget that our present peace is based on the sacrifices of these young people. The below gallery of images is a snapshot of memories in meeting Capt. Ogata's daughter Hiroko. 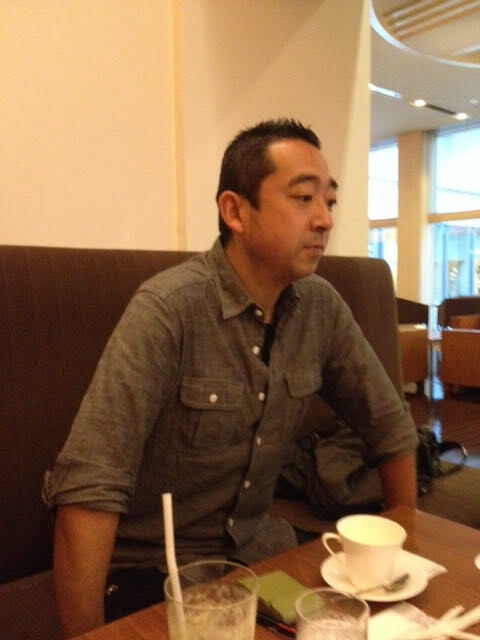 Toru Fukubayashi, my wife, Capt. Ogata's daughter and myself overlooking the city of Kobe near Mt. Futatabi on our way to the Dairyuji Temple. A very wet, rainy day.